haha, i totally feel for you. I was suckered into a website like this for pigs because I'm writing an article about them for the paper. My little brother and I look at the adopt-a-pup pages all the time.. same with cats. Really, it's a shame I'm allergic to kitties for I love them so much. You're lovely, but you know that. A few blocks from my house, there's a house that always has black and white baby kittens laying on the front lawn, so whenever Zak and I go for walk, it's really just an excuse to look at adorable cats, so I can relate. Anyway, that is such a lovely dress! And I love how you layered that beige blouse over it. Also, your hair is looking awesome, lady! LOVE your outfit! what a great vintage piece. and i think the next haircut i want is yours...i'm so serious. it's the most adorable thing ever. I LOVE CATS!!! haha Seriously, I once spent an hour of my life just watching YouTube videos of wittle kitties. And I got my boyfriend to do the same; he says I influenced him too much. There's nothing wrote with feline creatures! greatest 90's leopard print dress ever. I love all the layering too lady. Aww, I didn't grow up with cats but now I have to boys from the same litter and love them dearly. I love how you tamed this print with some coordinating solids...well done lady. ohhh like this outfit to bits!! and the bag is such a gorgeous color! that shade of blue is my favorite! You look great. I don't think I would buy a leopard dress (I only have a vest) but you got me to love that combination you're wearing. I love the layering of this outfit... whenever I try to put sweaters over collared dresses I look like a shapeless box, and you just look effortless. And I was giggling all the way through your story..very well written! And then I giggled some more over your other reader saving pig profiles! Your cat story really amused me. It was so funny. And cats is so adorable, I had cats all my life. It is just this last half year I have not had a cat, but I will get one again in August. I like the leopard outfit also. Funny story. And feline-print looks good against your impossibly-perfect skin. The next door neighbour's cat is always at our house (next to me now!) so we share their pet! hahaha you crack me up! you're such a good writer. :) I never really was a cat person, but my brother has the most amazing cat now named Swayze and he's ridiculous. Now I really want one. This dress is SO awesome. I've been wanting a leopard print dress in this style! I saw a similar one in TJMaxx but it wasn't quite perfect like this so I'm holding out. + I agree with Emily, you pull off the pull-over sweater over dress look sooo well. Sweater over dress! Best thing! I'm going to have to try this. This look is perfect! Digging that shade of lipstick. i love the shoes and the dress is so cute! I'm one of those people that cats find. Even my cat Zeus was given to me because when my sister got him as a kitten she couldn't keep him. And people are always asking me if I can take another kitten. If I took every cat that came along, I'd have at least 10. But they are SO CUTE! It's hard to resist those little faces. Anyway, I like how your outfit goes along with the theme of this post =) The layering looks really cool. 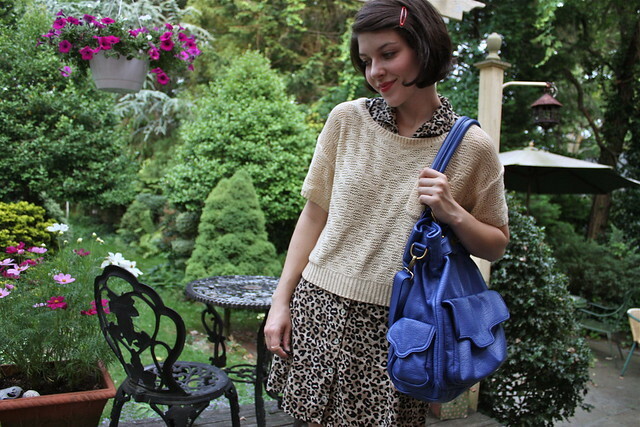 I love short-sleeved sweaters with dresses, and your hair is also adorable with the little barrette in it! Love this look! You looks so cute and elegant! The knitted shirt/ sweater is so pretty! This look is beautiful. I would love to wear every item and your hair is so adorable. I love this leopard print dress! The sweater you wore over it looks great. Also, your hair is adorable! Oh, and whenever my husband sees a cat (of any age) his voice goes all high and girly when he shouts "Kitty!" It is such a shrill shout of affection that I cannot manage to impersonate it. No, I am not kidding. love it! you look so 90s. by the way, lets hang out! find me on facebook!